Fotopedia Reporter invites photographers of all skill levels to contribute photos and organize them into an appealing collection using the app’s design tools. Lots of great magazine apps rely on the content and reputation of traditional print magazines. There are also many great independent magazine apps, blazing their own pixelated paths. "There are many great independent magazine apps, blazing their own pixelated paths. But apps that challenge the definition of 'a magazine?' There are fewer of those, to be sure." But apps that challenge the definition of “a magazine”? There are fewer of those, to be sure. Here are five apps that — because of form, content and/or style — might make you think differently about what a digital magazine can be. A quick glance at Trapit’s website might give you the impression that it’s yet another personal curation app, such as Flipboard, Zite or Pulse (though, of course, Flipboard now has some innovative “magazine” features, discussed below). However, Trapit does more than curate users’ preferred feeds. Trapit also now works with publishers (traditional or otherwise, such as brands) who want to use their own content as the core of a magazine-like, branded native app that can also include content drawn automatically from many other online sources. The external sources aren’t just mainstream, well-known publishers, but also a wide range of smaller sites. Trapit says its curation system is based on artificial-intelligence technology built for the Defense Advanced Research Projects Agency. Publisher Here Media, owners of The Advocate magazine, has already used Trapit to build a unique app, The Advocate Discovery, that includes news not only from The Advocate, but also from “the hundreds of queer news sources worldwide plus hundreds of thousands of mainstream sources already among Trapit’s hand-picked sources.” Trapit looks like an intriguing way a magazine publisher can expand its offerings without producing more content itself. It looks like a mixed metaphor: “The Panna TV feature allows you to watch the entire issue’s content.” Huh? Yes, you can now watch a magazine. That description, from the website for Panna, a video-based iPad cooking magazine, is actually accurate. When you open the preview recipe, you immediately find yourself watching a video about the dish. 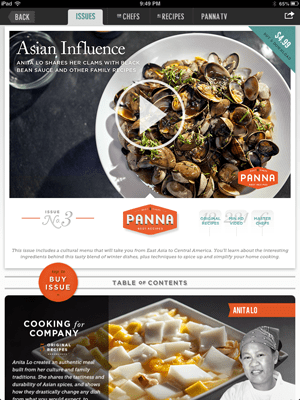 Yet Panna explicitly calls itself a “digital magazine,” not a cooking or recipe app, and offers subscriptions and individual issue purchases. You can “watch” each issue in the app, and each can be downloaded or streamed. It’s a combination of a sleek digital food magazine with a cooking TV show. For foodies who are just as happy to watch the recipe play out on the couch as on the cooktop, Panna might be the ideal reimagination of the food magazine. Panna: iPad only; free app; issues $4.99 each or $14.99 for a six-month subscription. Who needs Newsweek when you can read Symbolia? This app calls itself “the tablet magazine of illustrated journalism.” It combines serious reporting with illustrations styled after comic books and other forms of graphic storytelling. Symbolia takes advantage of the iPad format to experiment with a new style of reporting. Its stories use not just illustration and text to tell stories, but also include audio clips, animation and interactive elements in the digital storytelling experience. Though newsmagazines haven’t fared too well in the last few years, maybe Symbolia’s engaging, creative digital approach to telling insightful stories will succeed where print magazines have failed. Symbolia: iPad, Kindle, or PDF format; iPad app is free to download; single issues $2.99; annual subscription $1.99 per issue for six issues. I could write a long article on all the innovative photography magazine apps for tablets, but I don’t know of many that enable users to create photo stories and edit their own magazine-style collections. Fotopedia Reporter invites photographers of all skill levels to contribute photos and organize them into an appealing collection using the app’s design tools. Stories can be on any topic. 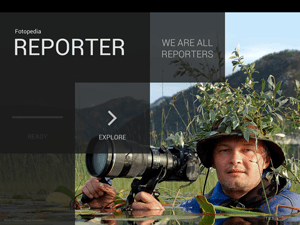 The app encourages “reporters” to demonstrate their knowledge of a specific area, write personal and engaging captions, and use creative formatting. Geolocation options are available, and Wikipedia content can be added to photos, too. 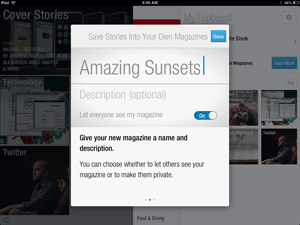 Users of the app can pull together favorite stories into a “personal magazine” to save and share with others. This concept of user-created, edited collections of content appears to be catching on — and, notably, the collections are called “magazines” by these apps’ creators, even if they don’t appear to fit the traditional definition of the medium. 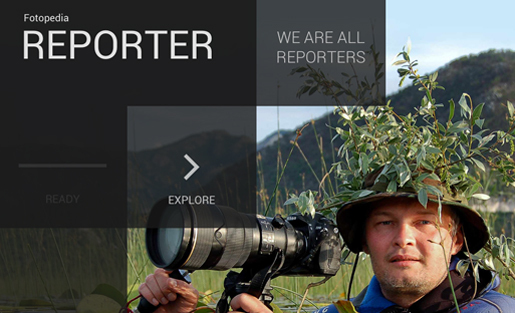 Fotopedia Reporter: iPad only; free. Along with Fotopedia, Flipboard also now encourages users to craft their own magazine-like content collections. The content curation app has long called itself a “social news magazine,” but it has recently added a feature that allows users to share specific content to their own personalized magazines. The actual magazine created from this process feels a little bit like a Pinterest board, with each personalized magazine containing photos and teaser text for the magazine creator/editor’s saved links — but the squares representing stories are arrayed across horizontally “flipped” pages, not a vertically scrolling screen. Flipboard’s users have already created a diverse selection of magazines and shared them with their comrades-in-app. A quick look reveals magazines on salads, the Beatles, the show “Mad Men,” World War I and air-cooled Porsches. Readers must trust that their fellow users can edit content into a cohesive “magazine” effectively. And for readers who trust no one and want to gather only their own reading material, many apps, in addition to Flipboard, enable that kind of collection, often in a magazine-like interface: Google Currents, Zite, Pulse and others. Flipboard: iOS or Android devices free. Do these apps lead you to expand your definition of a magazine? Which others have challenged your understanding of this medium? Susan Currie Sivek, Ph.D., is an assistant professor in the Department of Mass Communication at Linfield College. Her research focuses on magazines and media communities. She also blogs at sivekmedia.com, and is the magazine correspondent for MediaShift.